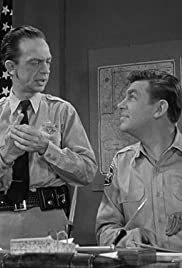 When a shoe salesman comes to town, riled Aunt Bee uses him to teach Andy a lesson in men being just as big a bunch of gossips as women. Emma Brand: I suppose you're not capable of gossiping. Andy Taylor: Oh-oh, I guess we're capable all right, but somehow or another it just don't come as natural to us as it does to you all. Written by Earle Hagen and Herbert Spencer. It's fair to say that even Willy Loman could have lapped Wilbur Finch's sales record prior to the shoe saleman's arrival in a Mayberry desperate to have the fame it believed it so rightly deserved. Emma has it right when she claims that he is the tamest travelling salesman she's seen. What an odd plot device to have a man from New York City roaming the southeast lugging a stack of shoe boxes, trying to make a living selling shoes. Was this a common sight in the early 60s? Among the townsfolk lined up to audition for Mr. Finch is the high-cheek-boned bit player who is often seen but never heard throughout the run of the series (usually referred to as Nice Dress Nellie from Andy's comment to her in "Andy Saves Barney's Morale"). We are left to wonder not only what talent she would spring upon the unsuspecting Finch but also what style shoes she might expect to find among his less than stylish line.The not-so-uncommon need in those days for a guest to request a television in one's hotel room is what spurs this story along into making Mr. Finch out to be much more influential than he could ever hope to be and introducing us to Floyd's son and his horn, a son who, like Barney's mother in episode 2, vanishes without fanfare or even a sax riff in subsequent episodes. You have to love Orville Monroe's mock sincerity as he enters the courthouse to offer his funerary services to Andy and his sudden realization that his hearse might be parked illegally.